Princess Charlotte Elizabeth Diana was born on May 2, 2015, and is the second child of the Duke and Duchess of Cambridge. Much like the fanfare surrounding her big brother's birth in 2013, the announcement of her arrival was proclaimed to mobs of merry well-wishers waiting in the streets of London. Looking forward to Princess Charlotte's next milestone, her baptism, Queen Elizabeth II, Kate and William gave their approval for the design of this proof. The Christening of the Princess took place on July 5th, 2015 at St. Mary Magdalene Church at Queen Elizabeth II's Sandringham estate in Norfolk; the Archbishop of Canterbury, Justin Welby officiated the service. Now you can own a precious commemorative celebrating the christening of the fourth in line to the throne. 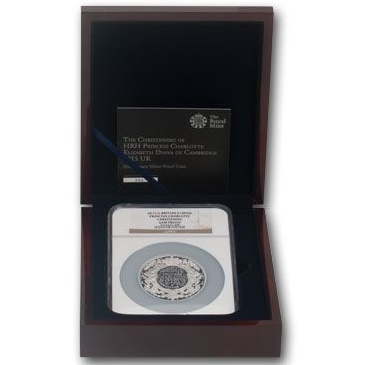 Each legal-tender £10 (Ten Pounds) proof is struck in five ounces (155.51 grams) of 99.9% pure silver, and graded Gem Proof condition by Numismatic Guaranty Corporation (NGC). The reverse echoes the design struck for the christening of Prince George. The coin bears a block symbol "crowned" with a coronet and features lilies and lily font, traditionally used for the baptism of royal children. 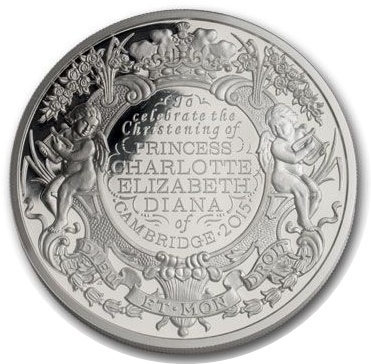 The inscription reads, "To celebrate the Christening of Princess Charlotte Elizabeth Diana of Cambridge 2015." The scroll at the bottom of the design contains the French motto, also used by the British Royal Arms, "DIEU ET MON DROIT," which is translated, God and My Right. 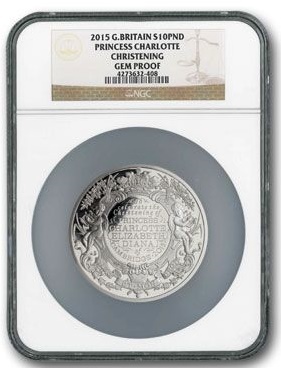 The obverse is graced with the fifth official portrait of Queen Elizabeth II, and great-grandmother to Princess Charlotte. Each comes in Gem Proof condition, graded by Numismatic Guaranty Corporation (NGC) and comes in a wood presentation case with a mint-numbered certificate of authenticity. 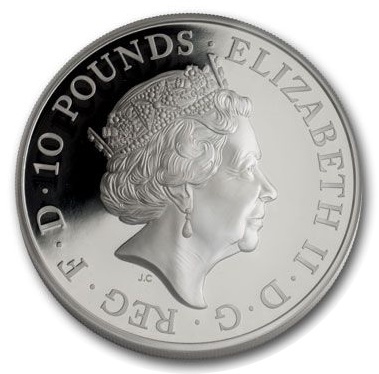 The mintage is limited to only 500 proofs, and the Royal Mint has allowed the first 100 coins to be designated as One of First 100 Struck right on the label. This porcelain-faced, beautiful bundle of joy will grow up before you know it.